SPOILERS: Discussion of events in Volumes 1-4 of the Kase-san and… manga series. Growing up is a difficult and messy journey no one ever really feels ready for. It’s even more challenging if romance enters the picture. It can be hard to find manga that shows both the struggles and joys of that awkward period, especially if you’re not straight. While there are a variety of love stories about high school boys and girls getting together in all sorts of genres, it’s much more rare to find a grounded, realistic series about two boys or two girls falling in love. That’s exactly why the Kase-san and… manga series is a breath of fresh air, a slice-of-life comedy that models what a healthy, queer romantic relationship can look like. The story follows two high school students, Tomoka Kase and Yui Yamada. Kase is on the track team while Yamada is the resident green thumb that keeps the school’s plant life healthy. Their interactions are limited to begin with, mostly involving Kase coming by to compliment Yamada’s work in the gardens. It’s the beginning of a new relationship, with all the obvious symptoms: Yamada is a blushing, nervous wreck, just like most teenagers with crushes. But she struggles, feeling like those emotions should’ve been saved for a boy. She grapples with this by thinking about how Kase’s athletic skill makes her more masculine as a way to make her crush more “acceptable.” It comes up frequently throughout the manga, which can be frustrating. This is a common, tiresome trope in yuri, particularly when a lead feels the crush is “risky” or “controversial.” But at the same time, those worries do come up for real teens, too. Coming out or realizing we may have feelings for someone of the same gender is not an easy feat when in a heteronormative society. Culture has trained young women to downplay their own feelings and see crushes as “just friendship,” lest they be considered weird or broken. Yamada is genuinely trying to recognize and validate her feelings any way she can with what she can. The two live in a small town where Yamada clearly doesn’t seem exposed to other queer couples, particularly queer female couples, so this journey is one she’s making alone. Yamada still has to work through those first steps, even if the reader might have moved beyond that. And for those who haven’t yet, it may be comforting to realize there’s a happy ending on the other side of those fears and that they aren’t the only ones who face them. Unlike Yamada, it’s clear that Kase has already reconciled with how she feels, particularly towards Yamada. It’s never specified how Kase herself identifies, but it’s very clear that she truly cares for Yamada and can see that she’s in a different part of her self-discovery process. Because of this, Kase works to remain aware of Yamada’s feelings and make her feel safe, all while Kase continues on her own journey. Kase is patient and always affirms Yamada in her desires and emotions. When the two officially get together, there’s a sense of peace. The manga portrays the world the girls live in as a comforting, relatively safe space. Yamada and Kase’s friends, for example, are supportive of their relationship. This support is very important because it also helps Yamada grow into her own, not only as a girlfriend to Kase, but also as an individual discovering more about herself. While it’s important to have works that deal with the harsher struggles queer couples face, it’s equally important to have soft, comforting stories to reassure young people that they can be happy and safe. But rather than stopping with the couple getting together, Kase-san decides to extend into what happens after “happily ever after” and show true relationship struggles. This is a relative rarity in romance stories of any kind, but just as important in order to show that maintaining a relationship isn’t just crushes and butterflies—it’s also work. Kase seems to be leagues ahead in understanding her feelings and what she wants out of a relationship. Yamada, on the other hand, is now in her very first relationship and trying to understand everything she’s feeling. While Kase is patient, she also makes sure to communicate what she wants, too. Talking is one of the most important aspects of a relationship, and the manga models not just how to be supportive of your partner but also to be clear about your own wants. As the term “partner” implies, finding an equal balance is important. A popular way to keep conflict going in relationship stories is for one character to hide their feelings. In particular, when a character is dealing with a tough issue, they decide that sharing their problems will burden their partner. Kase-san challenges this idea, too, emphasizing communication at a time when life can seem full of impossible drama. A particularly telling moment is Yamada’s bout with jealousy. Kase is extremely popular, while Yamada is more of a wallflower. This causes Yamada to marvel at the idea that they ever got together in the first place. When an old friend of Kase’s comes to visit, Yamada winds up feeling like a third wheel. While Yamada feels bad for being jealous, she tries to simply bury it rather than talking to Kase. But it won’t go away, and eventually Yamada acts so strangely that Kase notices—and, rather than shaming her or getting upset, Kase explains her relationship with her old friend so as to put Yamada’s fears to rest. In turn, Yamada recognizes how silly it was and feels more assured that she can trust her partner. It’s a typical plot, but the solution involves valuable skills that could be used in a real relationship. Yamada also struggles with feeling unworthy of Kase’s attention, especially since Kase attracts the affection of many girls. Once again, conversation is key. Kase tells Yamada how she’s impressed by all the hard work Yamada puts into her gardening. While many don’t seem to notice, Kase points out that she does and that it’s something she herself could never do. The two marvel at their differences, but find that their shared feelings is where their love comes from. Accepting and celebrating differences is crucial, but their love for each other is the same in spirit. 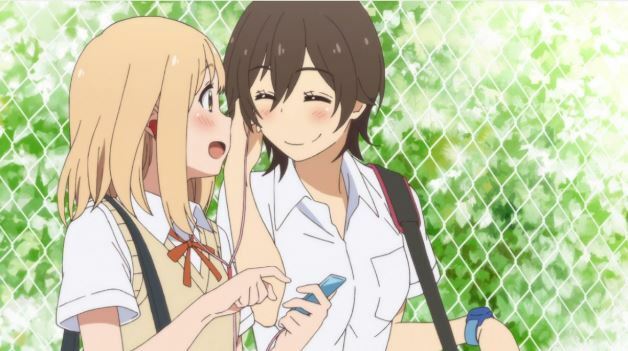 High school romances often end there, but Kase-san looks forward to adulthood and college. This is especially important for yuri, a genre whose most popular love stories tend to take place solely in high school or imply the relationship is a phase. Instead, Kase-san follows its couple into a new world. Kase wants to go to a school in Tokyo that has a great reputation, partly due to a track scholarship. But Yamada hadn’t put much thought into her education and assumed she’d end up attending a community college for literature like her mother wanted. The news that Kase is leaving distresses Yamada, who’s forced to look more seriously at what she wants out of her future. This leads to her finding a horticulture school in Tokyo, which won’t just let her be near Kase but also gives her the chance to pursue something she loves. While it’s Kase who prompts Yamada to think about the future, she ultimately picks something that furthers her own goals and career. She doesn’t go to Tokyo for her girlfriend, but rather because her girlfriend encouraged her to consider her future and what she truly wanted to do. The narrative ultimately focuses on personal growth rather than just romantic love. The most recently released story catches up with Kase and Yamada’s lives in Tokyo. What’s fun about this current arc is that these two have a blank canvas. They can do what they want and, now that they’re independent adults, they can also feel free to express and explore themselves in a different way. Together, they’re going to build a future filled with more journeys both as individuals and as a couple. We see Yamada’s internal dialogue change from worrying that she’s in love with a girl to accepting and loving that her partner is a woman. For the reader who’s read a hundred high school love stories that end there, this is a chance to see that their life and identity can and will survive the transition into adulthood. Kase-san is an ongoing series and one that really deserves more praise. It’s simple and sweet, but also educational. In its own way, it provides a dialogue that shows just how far communication and open-mindedness can take a couple, regardless of gender. Its sweet slice-of-life formula stays grounded enough to be both an escape for readers and an aspirational guide to building a healthy relationship. Not every manga needs to focus on providing good role models, but it’s important that those stories exist for the people who need them. Thanks to Kase-san, those readers can watch a healthy queer relationship build and grow. Ashley Glenn is a dual major in Gender & Sexuality and Journalism, going onto her final year of college. She is a journalist for a variety of outlets in Las Vegas and runs the anime blog Ashley’s Anime and the podcasting hub Black Moor Productions.